Shape up your home and keep your supplies out of sight with the help of plastic storage cabinets. Talking about storage cabinets, there are different types of materials to choose from ranging from plastic, wood to metal. Among these, plastic storage cabinets provide a more economical storage solution. Besides being less expensive, storage cabinets made of plastic are often lighter and have excellent weather resistance. There’s a wide range of options in the world of plastic storage cabinets. However, don’t let the numbers overwhelm you. 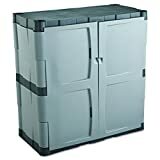 Look for the best plastic storage cabinet that’s built to last and has the right storage capacity for your supplies. So what’s the right cabinet to purchase? Well, that’s a hard question since what appeals to the other person may not necessarily work for you. However, there are certain storage cabinets that won’t disappoint. This article looks at the best plastic storage cabinets that you might want to consider on your next purchase. Have a cluttered garage space? Well, it might be high time that you give this plastic storage cabinet a try. The cabinet is made of tough plastic; a construction that makes it virtually indestructible. This is a cabinet that won’t be dinged by a yard and garage tools. There’s a fixed shelf that divides the cabinet into two. The cabinet has 10.7 cubic feet of storage space and supports up to 335 pounds. The double door sports a lockable design for maximum security. The cabinet snaps together for quick and easy assembly. It comes lightweight for easy relocation. This plastic storage cabinet comes in a sleek, space-saving design. 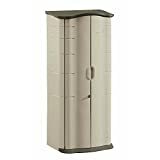 The cabinet is fabricated from heavy-duty plastic to provide a durable and sturdy construction that won’t tip over. It has a double door design that swings open to display 4 shelves. The shelves come rugged and are adjustable to different heights to accommodate larger supplies. The cabinet accepts a standard padlock to provide secure storage. It has built-in handles that make it easier to open the doors and give you an easy time during relocation. Assembly is easy and doesn’t require any tools. Get a practical storage solution for your garage with this plastic storage cabinet. It sports a high-quality construction fabricated from polypropylene resin material. This weather resistant resin holds up well in any garage or home setting. It doesn’t rust, dent, or peel. The cabinet has double swing doors that open up to reveal 4 adjustable shelves. The shelves can be adjusted or removed to create more storage space. Rubber seals are integrated into the cabinet to seal off dust and humidity. The top shelves hold 66 pounds while the bottom shelf holds up to 121 pounds. The beautiful platinum finish sported by this plastic storage cabinet transforms it into an elegant storage unit that’s sure to stand out. The cabinet is fabricated from heavy-duty resin material geared up for garage use. The resin construction keeps the cabinet rustproof and dent-free. Multi-wall panels come in handy to provide extra strength and stability. The cabinet has 2 shelves sporting a metallic reinforcement. The top shelf is adjustable to create more room for larger supplies. Each shelf accommodates up to 50 pounds. The cabinet has double swing doors and mounts on the wall to free up space in your garage floor. 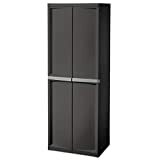 This cabinet comes in a tall design that maximizes outdoor storage space. The small footprint makes this cabinet ideal for limited outdoor spaces. 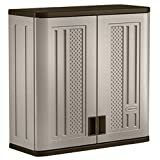 The cabinet is made of heavy-duty plastic resistant to weather, moisture, and sun damage. The shed accepts up to 5 custom fit shelves and allows for adjustments to accommodate large supplies. The door is lockable for maximum security. The cabinet comes in an 8-piece construction that’s easier to put together with common household tools. It’s quite lightweight to give you an easy time when relocating.